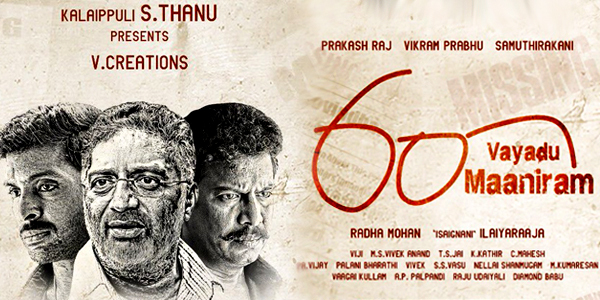 Music maestro Ilayaraja has composed for '60 Vayadu Maaniram'. Going by the subject of the film its may render itself to a much more mature and complex composition. And what more a fit than Ilayaraja for this task, listeners would ask. The album has four tracks with singer Beny Dayal in three. Pa Vijay, Vivek, Palani Bharathi have penned the lyrics for the movie. There is a yearning in this track. Ilayaraja brings the tone easily to the forefront without too much of congestion. While the composition remains pretty lucid and non-jarring, we discern a high philosophy of ‘search’ in this track. The search for the truth, the God is pondered upon with comparisons made with the search for oneself. The lyricist trying to portray the presence of Godness in everyone of us, though we have to follow an outward search to find ourselves within. And more such lines throughout the track point out Vijay’s maturity as a poet. A sweet sad start much more identifiable with Ilayaraja’s composition, Thedi Thedi uses an average beat pattern. But it gives the track its singularity, it’s detached-ness from the instrumental congestion- we’re able to discern lyrics much more easily in this simpler easily chewable forms. Vibhari and Benny’s surprisingly supple rendition adds a soft flavour to the track, which Ilayaraja has managed to elicit. Palani Bharathi has come up with some great metaphors and textual rhymes that makes this much more listenable. Naalum Naalum has a bland start and slowly grows on to a wonderful melody stitched into a slow rendition. Beat pattern might come off as little distracting to listeners while Monali keeps you hooked to her attention grabbing vocals. In some parts it’s also very nostalgic to listen to Naalum Naalum, like we’re transported to the innocence of the yesteryears. It’s a mellow down as you can expect from Ilayaraja, but it has its moments lulling us to only listen again. Naalum Naalum 2 retains the flavour of the previous, only here, Benny Dayal taking centre-stage. While it’s quite different, it more is like the masculine and the feminine of an androgenous composition. And the composer has pulled it off very nicely, making the track itself much more adapatible to the contours of male and female lead. Worth repeat hearings. Verdict: It's Ilayaraja's composition. You get nostalgia, peace and happiness. Mandatory prescription for Raja fans.